Captain Kirk switches personalities with an insane Dr. Janice Lester who finally gets a chance to become captain of the Enterprise. 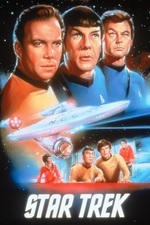 "Turnabout Intruder" is the final first-run, episode of the original science fiction television series, Star Trek. It is episode #79, production #79, written by Arthur H. Singer, based on a story by Gene Roddenberry, and directed by Herb Wallerstein. This was the last original episode of Star Trek to air on NBC. Originally scheduled to air at 10pm on Friday, March 28, 1969, the network pre-empted it at the last minute with a special report on former U.S. President Dwight D. Eisenhower, who had died earlier that day. On June 3, 1969, after an absence of 2 months, Star Trek was brought back on a new night and time: Tuesdays at 7:30pm EDT. "Turnabout Intruder" was the only first-run episode to be shown in this new time slot. So that's it. The entire run of the original series. The series ended with a whimper in my opinion, but I can now say I have seen all of the original episodes. There are actually lots and lots of licensed and non-licensed things where Kirk is woman-ified or whatever we'd call it, novels and comics and parodies and even a commercial from the 1980s where Shatner's Kirk is in a transporter accident with a woman and they swap heads. I guess the character is such an icon of masculinity (and he's also rather sexist, depending on the episode) and he's in this sci-fi setting where almost anything can happen, so it gives rise to this sort of thing. It's interesting that Lester seems to still have some sort of sexual/romantic hold over her man-friend, even when she's played by Shatner. The episode's not ambiguous about it, he still loves her and she kind of seduces him into continuing to help her plan, even though she's a man now. That's pretty surprising stuff for US TV in 1969. The episode arguably demonizes "women's libbers", but I think we're meant to agree with Lester's basic point, that women should be allowed to be starship captains. Her actions are wrong, but her motivation isn't. I know they were really talking about sexism in 1969, but given how progressive the show was in other ways (and given that Roddenberry had a woman play Pike's "number one" in the original pilot) it seems weird that they'd make Starfleet so sexist. This is supposed to be hundreds of years in the future! Lester's line, "Your world of starship captains doesn't admit women", was taken by some to mean that women could not yet become starship captains by this time. However, it might also mean that women are not allowed to intrude on the discipline and burden of command—an interpretation borne out by Lester's regret over not being able to have "roamed the stars" with Kirk. Captain Erika Hernandez in ENT: "Home" showed that there were female captains in the pre-Federation era but there is no firm evidence either way of female captains existing at this time. A female captain would appear 17 years later on the bridge of the USS Saratoga in Star Trek IV: The Voyage Home, and of course Captain Kathryn Janeway would take command of the USS Voyager on Star Trek: Voyager, 102 years after this episode takes place. In addition, approximately 75 years after this episode takes place, a woman would captain the USS Enterprise itself (or rather, the USS Enterprise-C), Captain Rachel Garrett (TNG: "Yesterday's Enterprise"). But I do recall reading somewhere years ago that Roddenberry said the line did mean there were no female captains at this point. If female captains were allowed, I can see Lester failing to make it anyhow because she's not exactly a selfless, heroic Starfleet type. Benway, I want to thank you for doing such a consistent job with posting these threads and getting us all the way through the re-watch. What a different experience it has been to see these episodes as an adult versus when it was high-school me's gateway show into organized fandom back in the 80's. As for the episode, well, I'm generally a sucker for a good body-swap/gender-swap episode. Though, it's better when the swap is between series regulars who have been working with each other long enough to nail their impersonations (Misha Collins is pulling off a pretty phenomenal one on Supernatural this season), though it can work with a guest star too (Stargate SG-1 did one with a youth-ified Richard Dean Anderson where the child actor was terrific). Since we only briefly meet the real Janice, there's nothing to really measure either performance against during the transference. Smith doesn't do much of a Shatner impression, and though Shatner is doing his best crazy-lady performance it's still very Shatnerian. It's a shame that the writing didn't really distinguish between Lester's unfit-ness for command and her femininity. The plot would have worked just as well if Lester was a man, some jealous former classmate of Kirk's who washed out of the academy and held him to blame. I wonder what this episode would have been like if they'd written it for a man first (some academy flunk-out former friend of Kirk's who blamed him for it) and then cast a woman without any re-writing beyond pronoun changes. Would have kept them from that awful "red-faced hysteria" line at least. I bet the K/S shippers back in the day got some mileage out of this episode though. That look Spock had on his face after the mind meld. Apropos of nothing - Tik Tok, everybody! I dislike body swap stories, myself. I guess partly because 1960s teevy was awash in them and they were usually just silly. On an explicitly SF show, it's just too much fantasy for my willing suspension of disbelief muscles, after accepting FTL, teleportation, universal language translation, parallel humanoid evolution, etc. *Sigh* Well at least Star Trek never attempted a human shrinker/enlarger episode. And anyway, magic body swap machine aside, there were still plot holes in this one sufficient to drive a fleet of D7 Klingon battle wagons through. However -- all that said, the court martial -- especially the conversation in the corridor -- were worth the price of admission. Nearly every ep had something worth seeing in it. As you said, out with a whimper rather than a bang -- well, the bang was at the end of last week's exciting episode. I'm told that -- in honor of this being the final ep, yet not offering the sense of closure modern audiences crave -- the remastered version of "Turnabout Intruder" ends with a new visual effects shot of the big E sort of sailing off into the sunset, so maybe watch out for that. Thanks, Benway, for hosting the series rewatch, it was appreciated. I do wish there'd been more comments over-all, but I still occasionally got some new perspective on a show I loved almost 50 years ago. I won't be joining you for TNG, so happy Trekking, all! My main memory of this episode is how fast it gets started. The transfer happens during the teaser! Yeah, thanks Benway. It makes me a little sad these threads didn't get more love. When the web was young, threads about this show would have spawned arguments that lasted months! Poor old Trek isn't doing so hot these days, when everybody is all burbbly about Star Wars... but mark my words: Trek shall rise again! This was always an indifferent episode for me, for reasons cited above: a deep strain of sexism, the plethora of body-swap plots on TV at the time, and the general underwhelming end to the series. But it does furnish us with a fantastic but of trivia: until Chris Pine took the role in 2009, Sandra Smith was the only person besides Shatner to play James Kirk in a canonical bit of Star Trek.